As we wave a super summer goodbye, autumn is truly beginning to tickle and that was the case the Saturday evening we visited Akamba. As we entered we left behind a nip in the air and menacing clouds and were instantly transported somewhere much more exotic than the sites geographical location in Shirley. 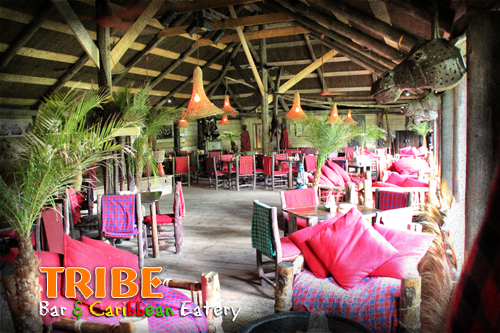 This African and Caribbean inspired food and music venue truly is a hidden and surprising gem. The large building is made all of wood, with a tin and grass roof. The walls are adorned with African art, made in the continent and for sale should one wish. Sales go to fairly supporting the artist and groups who create them. The lighting is low and atmospheric and reggae beats filled the air. Staff greeted us with whole-hearted smiles and friendly advice on finding a table. We were soon warmed with one of their many rums on offer which also joins an intriguing beer list which includes a banana bread beer and strong tipples like Dragon Stout, plus their own brew Tribe larger. We tried classic Jerk Chicken which was bbq flamed; succulent and juicy plus the vegetarian option of butternut squash curry both served with rice and vegetables. Staff were quick to take our order. The night we visited there was a gig on so the menu was reduced and was served street food style. We tried classic Jerk Chicken which was bbq flamed; succulent and juicy plus the vegetarian option of butternut squash curry both served with rice and vegetables. The dishes were lightly spiced, so an easy introduction to Caribbean cuisine but if you like it piquant they have an array of spicy scotch bonnet condiments to spike your dishes with. A well stocked dessert bar had plenty of baked treats to entice those with a sweet tooth. Portions were satisfying but not too filling to prevent getting you in the mood for the dance floor as the David Bowie tribute act, Major Toms took to the stage. A 5 piece ensemble who concentrate on being tight musically and knowing the legends classics opposed to dressing up. The atmosphere was excited and the mixed crowd were soon up and dancing as the band eagerly shared all of Bowie’s greatest. It was lovely to see how the rock star had touched the souls of so many across generations. This large venue has the ability of creating a warm, intimate and inviting vibe and they host plenty of music from tribute acts to reggae legends. They have ample parking and encourage visitors to leave their car and get a taxi home so they can enjoy a rum cocktail. I can see how much fun big groups would have here and it makes a refreshing change to have something so original compared to flat pack chains. A Christmas party here would make a welcome variation to turkey themed menus and everyone needs a little Caribbean flavour in the depths of winter. Can’t wait to go back! If you visit during the day there is a more extensive menu and the outdoor area also operates as a garden centre with an array of African sculptures to take home plus you can buy African store cupboard ingredients.